Happy last day of January! 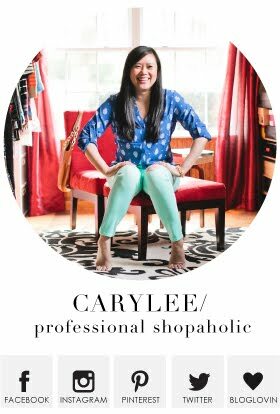 Now that February is looming, that means Valentine's Day is right around the corner, so I had no problems agreeing to a "red" collaboration with some of my favorite bloggers: Gina, Rachelle, Jo-Lynne, and Amy Ann. Red is my favorite color, though admittedly, I don't wear much of it outside of the pop of color here and there. (Well, not including baseball season anyway...) I've had these red bottoms for awhile, but hadn't worn them in forever! I figured now was a good time to style them again. I tend to reach for black or leopard or navy when I wear these red bottoms, so I decided on neutrals this time. A plain white tee is super easy to throw on, and the pairing of the suede moto jacket and studded pumps makes me happy because of the mix of textures. I seriously forget how great simple basics like this make for good outfit choices. I've been carrying this bag since we were in Florida for New Year's! 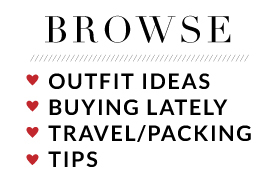 It's the perfect size to hold all my necessities while still being small enough to throw in my work bag or carry on. And, let's be real. It's quite easy on the eyes! I loved going matchy-matchy with the bag and the bottoms, so I didn't bother changing bags for these photos. I wore this to brunch on Sunday, and then the husband and I ran a few errands, so I ditched the heels and threw on some grey Converse. Lord knows shopping trips to Target require a lot of walking, so I figured I would make myself more comfortable. Plus, I was going into the office to decorate a co-worker's cube for his birthday, so I knew I would be climbing on top of desks! Probably not a good idea to do in Rockstuds! I mentioned last week that I want to do more remixing posts on the blog, and today was a great opportunity to pull this collage together for you. See what I mean about black, navy, and leopard?! Which outfit is your favorite? 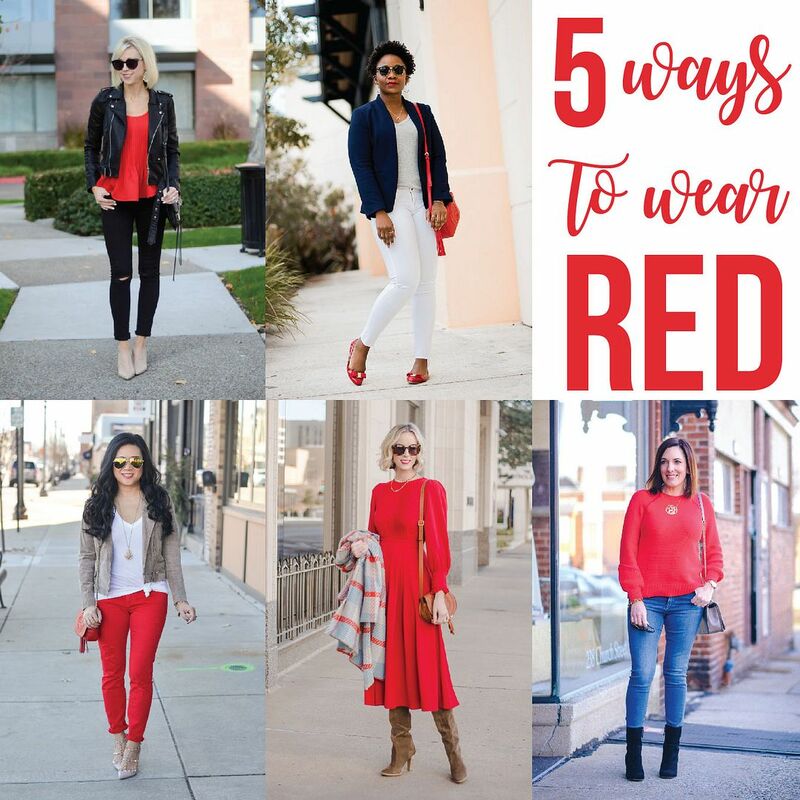 For more red outfit inspiration, be sure to check out the other posts by (clockwise from top left) Gina, Rachelle, Jo-Lynne, and Amy Ann! Thanks for stopping by! Such a fun look! 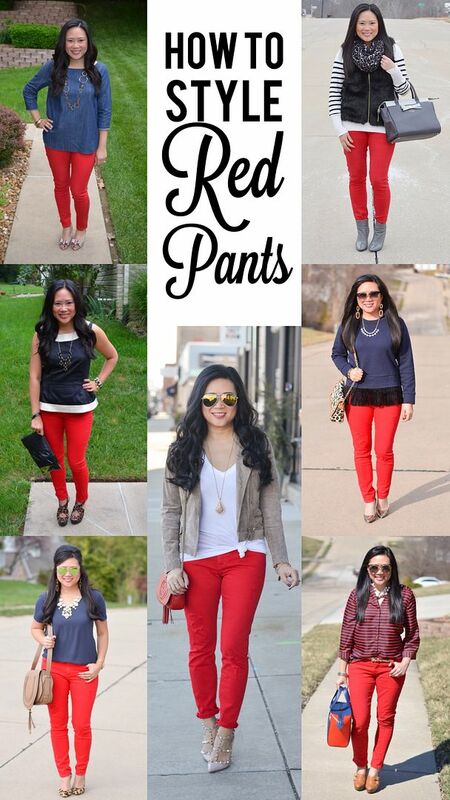 Love the red pants! 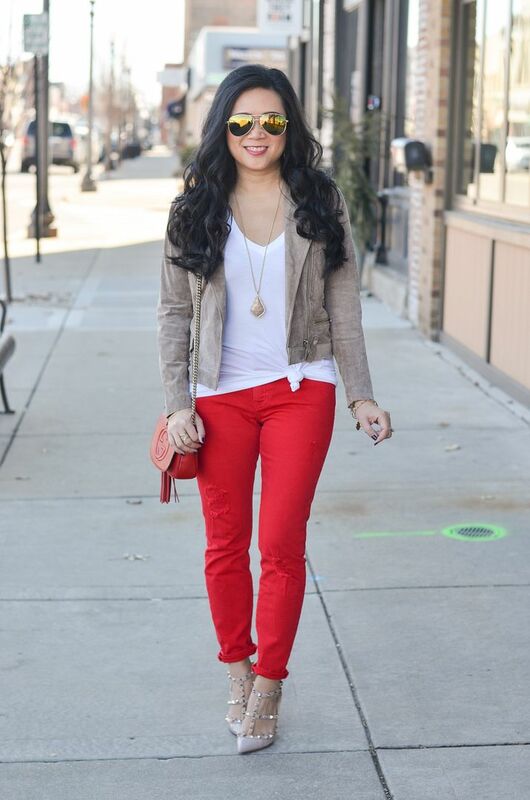 You rock red pants so well, love this outfit. 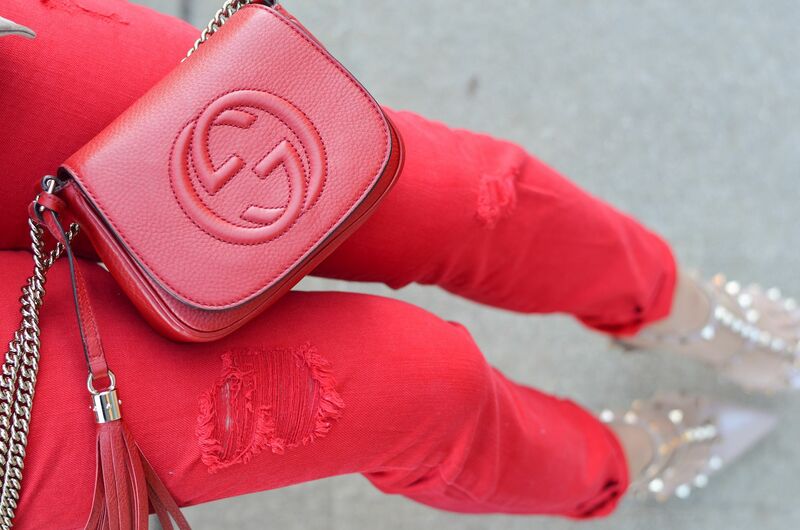 I have a pair of red jeans I haven't worn in forever. I should pull them out (and squeeze myself into them.HA) I love, love, love those shoes!!! These are so perfect for vday, they really pop! loving those pants! great look!